For exhibit organizers keeping track of your trade show success and reporting it to other team members can be difficult when dealing with so many logistics. 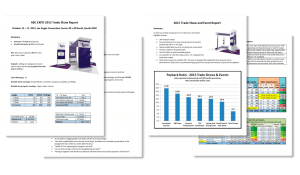 We’ve put together sample reports that you can use to help you make sense of all your numbers and track your R.O.I. This is what you need to prove and justify the value of your trade show program. The Measurement Made Easy! CD contains 20 planning templates that will help you make better decisions for your exhibitions. 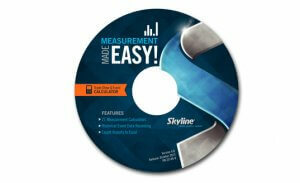 Click here to request your free Measurement Made Easy! CD. 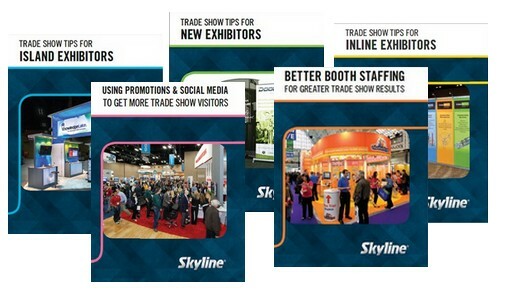 Skyline has just launched a new series of exhibition guides tailored to each type of exhibitors. These guides contain the best articles published on the Skyline blog and worksheets made by Marc Goldberg from Marketech Inc. This 56-page book contains 34 articles. Half are geared toward increasing skills and perspectives of individual booth staffers. The other half are for the trade show managers and trainers who must prepare their booth staff. This book contains 28 articles about trade show promotions, such as selecting promotions, creating an invitation list, pitfalls to avoid, details to watch for, and more. There are also articles about integrating social media with your trade show program. This book goes deeper in areas such as booth staffing, exhibit design, measurement, lead management, and logistics. There are also articles written especially for the unique challenges faced by island exhibitors. This book, specially written for exhibitors using smaller inline exhibits, gives essential information about trade shows, including exhibit design, booth staffing, promotions, lead management and result measurement. This book provides you with the tools you need to get started. Most of all, it provides you with a base level of expectations you can take to heart about the challenges and potential to succeed at trade shows.